The Iowa State Cyclones had the #15 Kansas Jayhawks on the ropes, but they couldn’t deliver the finishing blow in their 41-36 loss on Saturday. The Cyclone defense got a rare second half stop, giving the offense the ball with 2:36 remaining in the game and ISU trailing by five. QB Austen Arnaud led the offense down the field, but the drive ended at the Kansas 31 yard line when Arnaud’s fourth down pass fell to the turf just out of the reach of Darius Darks in the Jayhawks end zone. Iowa State falls to (3-3) overall and (0-2) in the Big 12 Conference. 1. The Offensive Line deserves top billing again this week. Iowa State rushed for 219 yards on 43 carries against a top ten rush defense. The OL did surrender one sack, but it was for only 2 yards. 2. Alexander Robinson is an absolute warrior. ARob fought through a nagging groin injury and a stinger in the second half for 204 total yards and two touchdowns. 3. Austen Arnaud played an outstanding game throwing for 293 yards and rushing for 67. Austen threw for 2 touchdowns and ran for another and his completion percentage was better at 62.5%. 4. 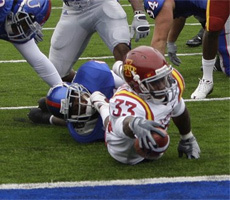 The Cyclones did not turn the ball over and were flagged just one time for 6 yards. 5. The spread offense is evolving and a nice run/pass balance is beginning to form. Iowa State threw for 293 yards and ran for 219 for 512 yards of total offense. 7. Playmakers are emerging in the passing game – Jake Williams and Marquis Hamilton both had nice games again, but it was good to see Darius Darks and Derrick Catlett chip in with 5 catches each. Josh Lenz was also more involved in the offense and looked good. ARob’s 52 yarder from Arnaud was the longest play of the game for Iowa State. 8. Iowa State made some nice halftime adjustments – the Cyclones scored on their first two drives of the second half (FG, Touchdown) and they forced Kansas to punt on their opening second half drive. 1. Iowa State is still learning how to win big games. Arnaud did a great job of eluding defenders to get the final throw off just missing Darks in the end zone. It definitely wasn’t an easy throw or catch, but great teams find a way to make that play and win the game. 2. The kicking game cost us for the second week in a row. We lost a total of 5 points on kicks, Grant Mahoney missed two extra points and we missed out on 3 points on a bad snap/hold on a FG try. Not coincidentally the Kansas margin of victory was 5 points. 3. Kansas put up HUGE numbers in the passing game – Reesing 37-49, 442 yards, 4 TD – Meier 16 catches, 142 yards, 2 TD – Briscoe 12 catches, 186 yards, 2 TD. Unfortunately Iowa State doesn’t have the athletes to match up with a top offense like Kansas right now. 4. 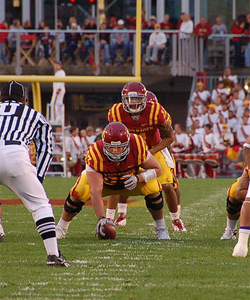 No Pass Rush – the Cyclones couldn’t get any pressure on Reesing, even when we brought blitzers. The lack of pass rush contributed directly to the video game numbers Kansas put up throwing the football. 5. Kansas had 551 yards of total offense and 34 first downs – Enough said!